Tom Larimer guides clients into multiple steelhead during the highest sun of the day on the Deschutes (typically, while other fly fishing guides are digesting lunch and waiting for shaded water), and it becomes apparent Larimer’s a traditional steelheader with little use for convention’s impracticalities. This no-nonsense approach has found considerable respect among the folks at Airflo Fly Lines, Simms, Hatch and Solitude Fly Co.—companies for whom Tom’s input holds profound influence. Tom’s flies are designed to make fish eat. Tom Larimer is an experienced guide who's passion for steelhead is only equaled by his love for trout. 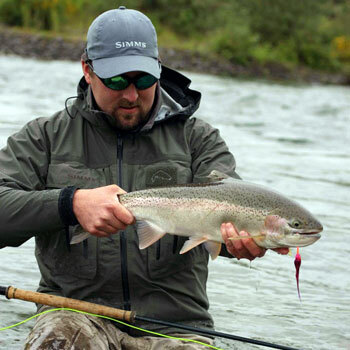 Listen in to Tom share his secrets about fly fishing the Deschutes River. The Spey lines he has designed for Airflo make casting these flies effortless. Above all, the fact that Tom is one of the few jet boat guides in the history of the Deschutes to offer “fly fishing only” trips originating from Heritage Landing seems to further this unconventional notion. While steelhead capture Tom’s passion for a good part of the season, his obsession with chasing trout is obvious from the moment you step into his boat. The fact he has five different golden stonefly patterns all designed for specific fishing situations gives a brief insight to a brain that is completely saturated with the sport. After 17 years of guiding the Great Lakes, Alaska and Oregon, Tom has settled in Hood River, Oregon. He works summers and falls at his camp on the Deschutes, and then moves to the Clackamas come winter. Outside of guiding, Tom is one of the most revered Spey casting instructors in the world. Additionally, he hosts trips to some truly amazing fly fishing destinations. In the rare case he’s not booked Tom’s probably fishing, just as any true addict would be.